MANHATTAN — Days after Fashion's Night Out crowds flooded the streets of SoHo and smashed the windshield of a car while its driver sat inside, City Councilwoman Margaret Chin is pushing the city to crack down on next year's running of the Anna Wintour-backed style extravaganza. After fielding angry phone calls from SoHo residents since the Thursday, Sept. 6 event tied to Fashion Week, Chin has asked Mayor Michael Bloomberg to ensure that more police are on the streets at next year's Fashion's Night Out and for him to consider supporting other measures to keep the citywide shopping event orderly. Cops are currently searching for two suspects wanted for criminal mischief and inciting a riot stemming from the car attack, in which a swarm of people surrounded a man's Audi at Broadway and Bleecker Street at about 11 p.m. and jumped on the vehicle. 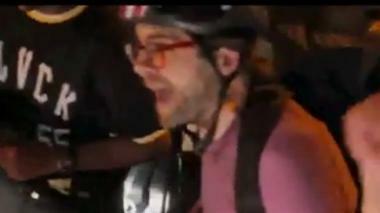 As video of the incident shows, the first male suspect parked his bicycle in front of the car to prevent the driver from moving forward, while the second male suspect hopped onto the vehicle, breaking windows and causing "extensive" damage, police said. Cops arrested two people at the event for disorderly conduct and obstruction of government administration, police sources said. Chin raised the issue during a conversation with Bloomberg and Quinn Tuesday, Chin's spokeswoman said. Solutions she is considering include closing streets to traffic and instituting a wristband system to help prevent minors from being served alcohol. 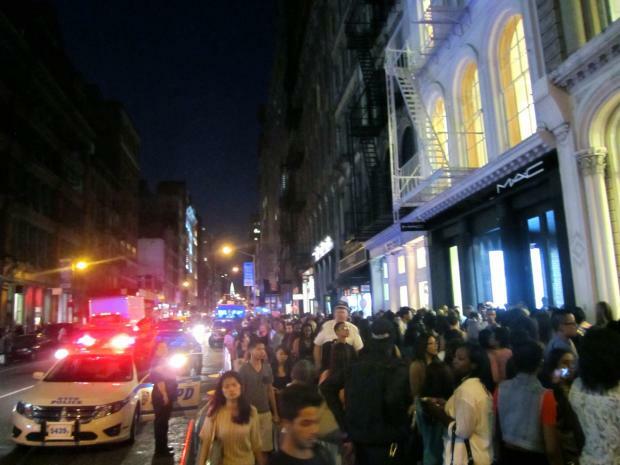 Creating separate entry points for Fashion's Night Out revelers and neighborhood residents was also discussed, the spokeswoman said. A Fashion's Night Out organizer said the event is closely coordinated with the city's permitting office, but he declined to talk about specific security upgrades for 2013. "Planning for next year will begin in the coming weeks, and we will be reviewing how to make the event an even greater success," said Ernesto Friere, a vice president of NYC & Company, one of the groups managing the event. Community Board 2 chair David Gruber said the board would work with Chin on efforts to calm an event he called "out of control" this year. "We want to examine the viability of continuing it," he said. SoHo residents told DNAinfo.com New York that they liked the idea of the shopping festivities — which were created by Vogue magazine and the Council of Fashion Designers of America in 2009 to give a boost to the industry — but that young fashionistas brought noise and disorder to their doorsteps.